From an undergraduate degree in languages, through a trainee management programme that involved everything from washing cars to profit and loss accounts, to coming first in her MBA class at Smurfit, Niamh Townsend’s drive to succeed has seen her join one of the world’s biggest technology companies. Dell Ireland is one of the country’s flagship tech companies and Townsend’s passion for the company is evident, particularly in the wake of signing a major partnership with distribution firm Exertis. Her initial training in Enterprise Rent A Car prepared her for a career in business, she says, but it was the ‘rounding out’ she got at the Smurfit Business School that provided her with confidence dealing with different aspects of business. “Business wasn’t my initial area of interest, I wanted to study languages, basically to communicate with anybody I met! I would always try and pick up even ten words of a language wherever I went, and I focused on that at university”. Although the link might not be obvious, Niamh says this focus on communication has stood to her throughout her career, “dealing with customers is all about communication”. While she has no “celebrity” role models, her advice on who to look up to is practical for any woman in any industry. “My first manager was really empathetic and showed weakness, which I think is a real strength”. It was the same when she joined Dell. She advises women starting out in their careers to look for a mentor, but someone who is not too senior – someone who remembers what it’s like to be in a junior position is more likely to offer useful advice. 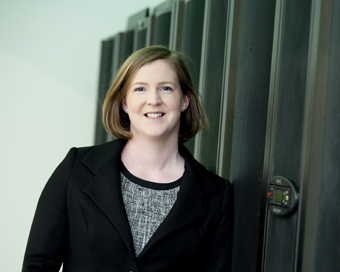 There is a conscious focus on gender equality within the company, which has a number of female senior managers, and Niamh was encouraged to get involved in the women’s network when she joined Dell. She says Dell’s employee resource groups, linking staff across the company, are invaluable because they make people more engaged.